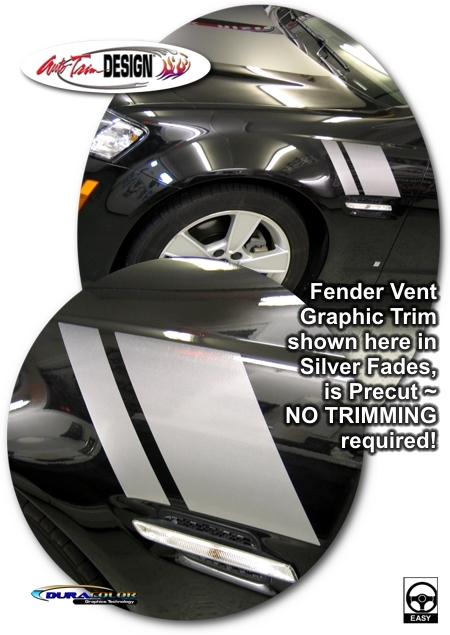 Set your '08-'09 Pontiac G8 apart from the rest with our simple yet aggressive two (2) piece Fender Vent Graphic Trim Kit that starts as a light fade (color of your vehicle shows through the fade) at the top and fades to solid at the bottom of the graphic as shown in the picture. Designed to be placed along the distinct body line just above the Vent of each Front Fender, these Euro style graphics are PRECUT and ready to install - NO TRIMMING required! Kit includes one (1) Fender Trim piece for each side of the vehicle. Kit may fit the UK version of this vehicle (Commodore).